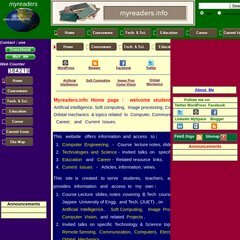 myreaders.info Soft Computing : Course content, Lecture note, slides, text books ..
myreaders.info Artificial Intelligence : Course content, Lecture note, slides .. The site has about 140 users daily, viewing on average 1.80 pages each. vit.ac.in VIT UNIVERSITY, Vellore, Tamilnadu - 632 014, India. Its IP Number is 69.175.127.194. ns3.pipedns.com, ns1.pipedns.com, and ns2.pipedns.com are its DNS Nameservers. American Registry For Internet Numbers (Virginia, Chantilly) is the location of the Apache server.